This is the perfect place for your Frio Vacation! Located on two acres, COWBOY HOUSE, is a 4 bedroom, 2 bath home that sleeps 16 in beds. Each roomy bedroom is named and decorated accordingly – with the western theme carried throughout. The kitchen is fully furnished with a wonderful snack bar to feed all those hungry little Frio River tubers. The dining table is in an area with two walls of windows so you aren’t missing out on any of the natural beauty and wildlife outside. Inside the spacious living room is a huge wood burning fire place, just in case you want to move the fun inside or take advantage of fire place in the winter months for family get a ways and gatherings. Outside you are nestled in the oak trees with all the privacy you could imagine. For your outdoor fun there is a covered carport, a small outdoor kitchen and BBQ pit, as well as a patio that is large enough to call your own dance floor. The COWBOY HOUSE has a new sports swimming pool, outdoor volleyball, tetherball, “swing set”, and a golf putting green. The outdoor area has an improved patio gathering area with fire pit. 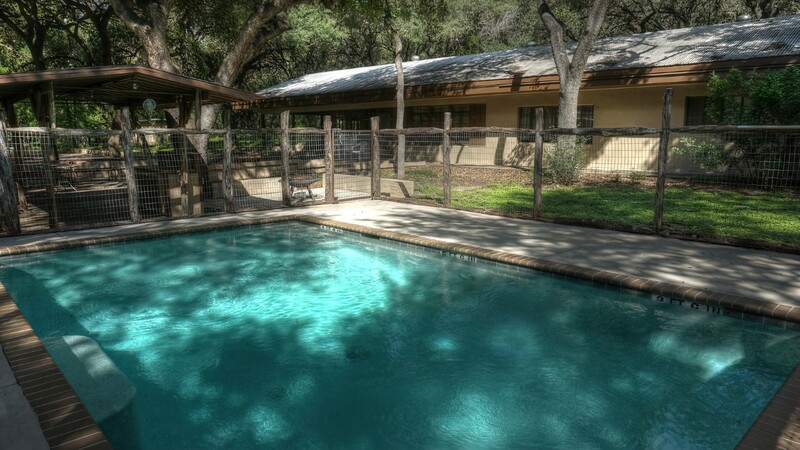 The COWBOY HOUSE is conveniently located ½ mile (just minutes away) from the Frio River at Neal’s Crossing. Easy access for bikers with protected covering with the double carport for motorcycles. Ample parking (6 cars) and great outdoor activities. Click here for more details and photos of the Cowboy House.